Mousse is one of those desserts that can be made a myriad of ways and comes in all kinds of different forms. Some don't like to make (or eat) it because of uncooked eggs in the mix but, I found this baked version that puts that fear to rest. The mousse mixture contains sugar, chocolate, eggs and butter. This concoction is combined and poured into a round baking pan. It is then placed in a bain-marie in the oven. I was not sure what to expect texture-wise. Would it be runny, soft or firm when it came out? After 40 minutes it was finished and was solid. I let it cool and inverted it onto a cake plate and placed it in the refrigerator since we weren't going to eat it that night. I did, however, sneak a small taste and the texture was smooth and not too sweet but I wasn't entirely convinced I liked it. The next day the mousse tasted fabulous. It was like dense chocolate cake with the texture of a cheesecake. It was moist but a little crumbly and melted on the tongue. The mousse sliced like a dream as well. I was pleasantly surprised that my family liked it and asked for seconds. It was not quite as sweet as it should have been since I had to substitute some of the semisweet with unsweetened. 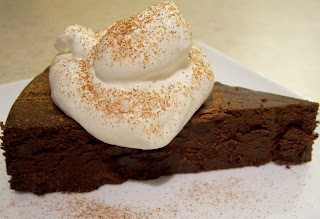 After adding a generous dollop of cinnamon whipped cream and I had a impressive, yet easy to prepare, dessert. Menu For Hope is here once again. For those of you who don't know, Menu For Hope is an annual online raffle created by Pim that benefits humanitarian causes around the world. This year the beneficiary is once again the United Nations World Food Program, specifically the school lunch program in Lesotho, Africa. The raffle runs from December 10 to 21 and you can see the complete list of prizes at Chez Pim. 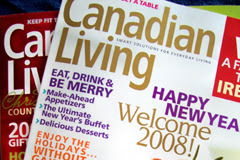 This year I am donating a one year subscription to one of my most favourite magazines - Canadian Living. CL is known for their fabulous "Tested til Perfect" recipes, informative articles and crafting ideas. I have had a subscription since 2000 and I know that whoever wins this prize will not be disappointed! If you would like to buy a ticket for this prize, the code is CA 04. To see the entire list of great Canadian prizes, please visit the Domestic Goddess. 3. Please specify which prize you'd like in the 'Personal Message' section in the donation form when confirming your donation. You must write in how many tickets per prize, and please use the prize code (for example CA04). Check Chez Pim on Wednesday Jaunary 9th, 2008 for the results of the raffle. * N.B: Canadian tax laws prohibit charitable donation receipts to be issued by registered Canadian charities for raffle or lottery tickets. The UNWFP is a U.S.-based charity; should any donation receipts issued, you should seek the advice of a professional regarding applying them to your Canadian income tax return. The holiday season would not be complete without sugar cookies on the dessert menu. They're one of the most versatile cookies out there - they can be shaped into anything you desire or simply rolled in sugar or decorated with icing. 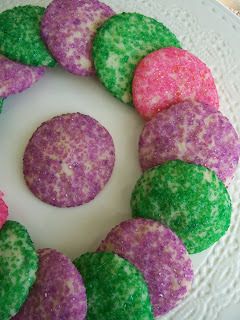 The sugar cookie recipe I used is from BHG and I liked it because there was no chilling time required. I don't mind making rolled cookie-cutter cookies but sometimes you just don't have time to wait. The dough is straightforward and I was able to make the cookies immediately, though if you need to, refrigerating them is not a problem. An important thing to remember when rolling the dough into balls is to not use too much force or 'smush' the dough unnecessarily. This will usually result in tougher cookies that are missing a tender crumb texture. Afterwards, I (quite liberally) rolled the balls in different coloured sugars just for fun and visual interest. The cookies also bake at a lower temperature for a longer time (sort of like shortbread) so they come out very lightly browned on the bottom and melt in your mouth delicious. They're perfect to make with kids (or anyone who loves sprinkles) and are easy enough for the most novice of bakers so give them a try. Happy Baking!